Renault Duster was launched with a bang, with a promotional advertisement even before the launch, which meant "We apologize if you have recently booked a sedan" they meant that the car would be launched at the prices of that of sedan. With this, they were able to attract many prospective buyers wanting to convert their sedan purchases to SUV, which is considered as a status symbol in India. 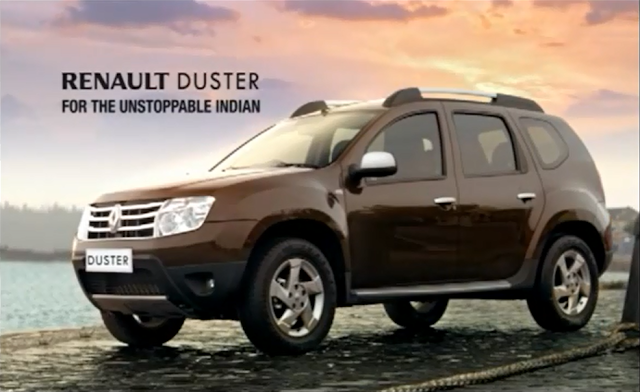 The Renault Duster was finally launched on 04th July 2012. Renault India played a smart strategy similar to some thing which Nissan did for Sunny launch, both of them placed the lower variant of petrol models at a very attractive price, remember Nissan creating attention with the launch price of Rs 5.73 Lakh for the Petrol XE variant. However, Nissan Sunny for the high end fully loaded diesel variant was still cheaper and attractive at Rs 8.93 Lakh. Duster was followed by their launch and has always been a strategy to place their product at a little higher price than Nissan's though both of them share lot of things including the engine - 1.5L dCi engine. The highest variant of Duster if compared to Sunny was placed at Rs 9.99 Lakh, ex-showroom price (we are comparing 1.5L 85 bhp engine of Duster since Nissan Sunny comes in this variant only - along with inclusion of ABS + EBD + Airbags). which was still apprx. 2.0 lakh higher as compared to Nissan Sunny, which is far more spacious than Duster. Duster has now launched their advertisement. Play the video below to watch the monster.